Interest in daylighting and lighting design has never been higher since physiologists discovered a new type of cell in the human eye in 2001. These cells send information about light intensity to the brain centres responsible for controlling circadian rhythms to patterns of light and dark. This tells our bodies when to sleep (“It’s dark!”) and when to awaken (“It’s light!). This discovery and related research led the Commission Internationale de l’Eclairage (CIE) in 2004 to create five principles of healthy lighting. The principles interpreted the evidence to conclude that people living in industrialized countries receive both too little light by day and too much light by night for optimal well-being. One solution to this problem, the CIE suggested, was a renewed emphasis on architectural daylighting. Daylight is rich in the blue-green area of the visible spectrum (to which the newly-discovered cells are most sensitive) and bright at the times of day that seem most important to regulating circadian rhythms. The rapid growth in knowledge has spurred the lighting industry and regulatory communities to develop novel lighting and daylighting products and to propose new standards and guidelines. Despite some excellent progress, industry still lacks impartial information to support their innovations and designs. Human well-being relies on regular exposure to light and dark each day. 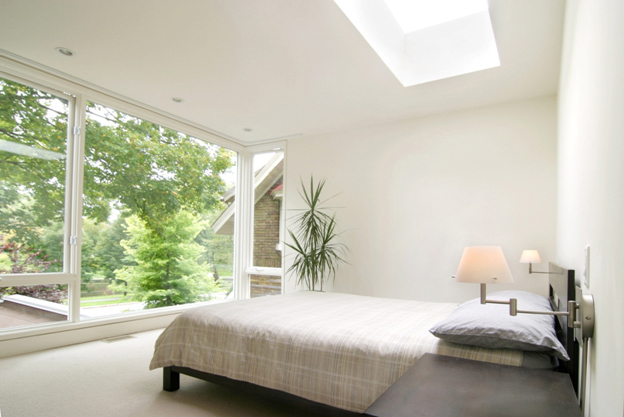 Daylight is the most energy-efficient means to deliver the light exposure. Uncontrolled daylight also can cause problems; glare from the sun reduces visibility and causes visual and thermal discomfort. The optimal pattern of light and dark exposure—as well as the limits at which daylight control is needed—varies by race, age, and individual differences. The desire for daylight also depends on how building openings affect the appearance of the space, on the function of the space, and on cultural norms about privacy, enclosure and view. A view of the outdoors is also a contributor to well-being, particularly if it is a nature scene or similar pleasing sight (Figure 1). Windowless spaces create monotonous conditions that may be stressful. Using daylight is sustainable only when balanced against the effects of windows and skylights on the building envelope, ventilation, and overall energy balance (Figure 2). Establish the optimal daily pattern of light and dark exposures for good mental and physical health. Determine how our homes can help us to live in the healthy pattern of light and dark, taking into account the way we use windows and shading to control privacy, glare and temperature, as well as light exposures and view. Develop design solutions and technologies for different climates that deliver healthy light, warmth, view, and fresh air, with a minimum of energy use. The results of this review, together with industry consultations, are guiding new research activities at NRC. Figure 1. A view of nature can help ease the stress of everyday life. (Architect: John Donkin. Photo used with permission: Peter Fritz). Figure 2: Windows serve many functions. Optimizing their design demands a balance between the simultaneous considerations of providing view, daylight, ventilation, and thermal control suitable to the orientation and climate. (Architect: John Donkin. Photo used with permission: Ewald Richter). The full report is available online at: http://dx.doi.org/10.4224/20375039. For more information, contact Dr. Jennifer Veitch at jennifer.veitch@nrc-cnrc.gc.ca or +1- 613-993-9671.